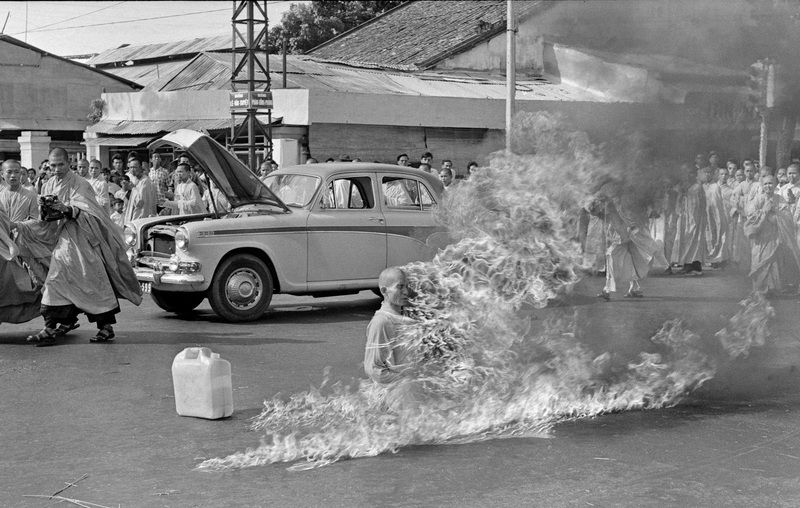 The self-immolation was done in protest to the South Vietnamese Diem regime’s pro-catholic policies and discriminatory Buddhist laws. In particular this was a response to the banning of the Buddhist flag, just 2 days after Diem had held a very public ceremony displaying crosses; earlier in his rule he had dedicated Vietnam to Jesus and the Catholic Church. The growing resentment of Buddhists under Diem was one of the underlying issues of South Vietnam, and eventually led to a coup to put in place a leader who would not alienate Buddhists, who made up 70-90% of Vietnam’s population. John F. Kennedy said in reference to a photograph of Duc on fire, “No news picture in history has generated so much emotion around the world as that one”. Photographer Malcolm Browne captured the scene in Saigon for the Associated Press, and the stark black and white image quickly became an iconic visual of the turbulent 1960s. Buddhist discontent erupted following a ban in early May on flying the Buddhist flag in Huế on Vesak, the birthday of Gautama Buddha. A large crowd of Buddhists protested the ban, defying the government by flying Buddhist flags on Vesak and marching on the government broadcasting station. Government forces fired into the crowd of protesters, killing nine people. On 10 June 1963, U.S. correspondents were informed that “something important” would happen the following morning on the road outside the Cambodian embassy in Saigon. Most of the reporters disregarded the message, since the Buddhist crisis had at that point been going on for more than a month and the next day only a few journalists turned up, including David Halberstam of The New York Times and Malcolm Browne, the Saigon bureau chief for the Associated Press. Duc arrived as part of a procession that had begun at a nearby pagoda. Around 350 monks and nuns marched carrying denouncing the Diem government and its policy towards Buddhists. Previous Inmates at Wöbbelin concentration camp. Next Lyndon Johnson meeting with civil rights leaders. I must add that with all due respect to your work, I very much dislike that you brand colorized images.